The tools of the trade. Yes, those are Tonka trucks. The countdown is on until opening day for the Ranch Community Garden where I will be having a garden plot all of my own. The workdays are getting longer as they hustle to get everything in. 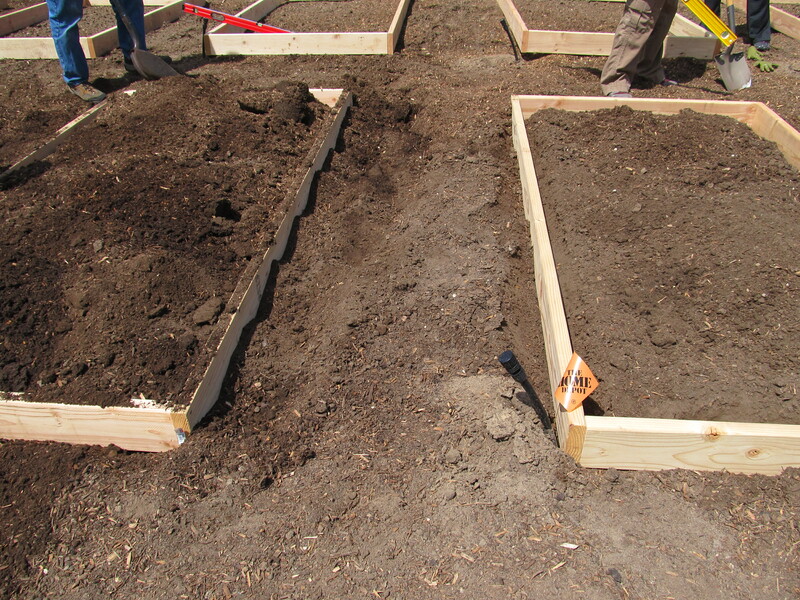 Today, we finished setting the frames for the raised beds and filling them with dirt. It was a lot of beds, there are 120 in total and not quite half had been put in already, but just over a dozen people came and went throughout the day as schedules and sore muscles dictated, so the task wasn’t overwhelming. Partially done as we move down the line. drying out excessively. What we were shoveling into the gardens was the mostly decomposed wood mulch and the soil it had been protecting. 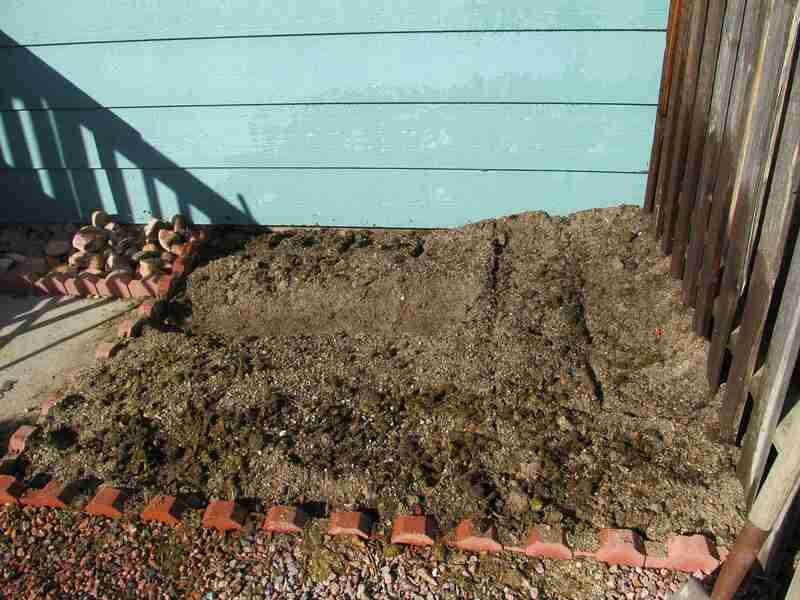 I think that amending the soil and then adding a frame to mostly just delineate the bed is a good way to go for someone who has the time for the amendments to be worked into the soil and has soil they don’t mind using. It is certainly cheaper and has a smaller carbon footprint than importing soil to fill a frame. The garden is on the grounds of the Beth-El Mennonite Church. The founder of the garden is a member of the church, and they had land that suited his needs, so they were able to help him get the idea under way. Each time I have been out to help with the set-up, there were church members helping out, too. Most of them weren’t going to have plots, they were just volunteering in their community. I actually had a very interesting conversation this afternoon with one of the members about community and comparative religions. Being Colorado Springs, conversations about religion are bound to happen eventually. The conversation we were having, I feel, was starting to build community in the garden. When you work with people for several hours, you’re bound to talk about something. It was very interesting to have a deeper conversation than I was expecting, and it reinforced my hope that being part of the community garden will help me to build my community. Two days worth of work. I like the subtle terraced effect the slight slope of the hill gives to the beds. I don’t know when I’ll be able to get back there myself, but there are several more work days coming up if you happen to be in the area. There are also available beds, if you feel the need to play in the dirt with the rest of us. Once the garden is open, there will be plots set aside for a local food bank that I’m sure will be able to use the occasional afternoon of community work. In the meantime it’s back to nursing sore muscles and missing the calluses I used to have on my hands. This is my most ambitiously sized garden at the moment. It started small. Don’t they always? 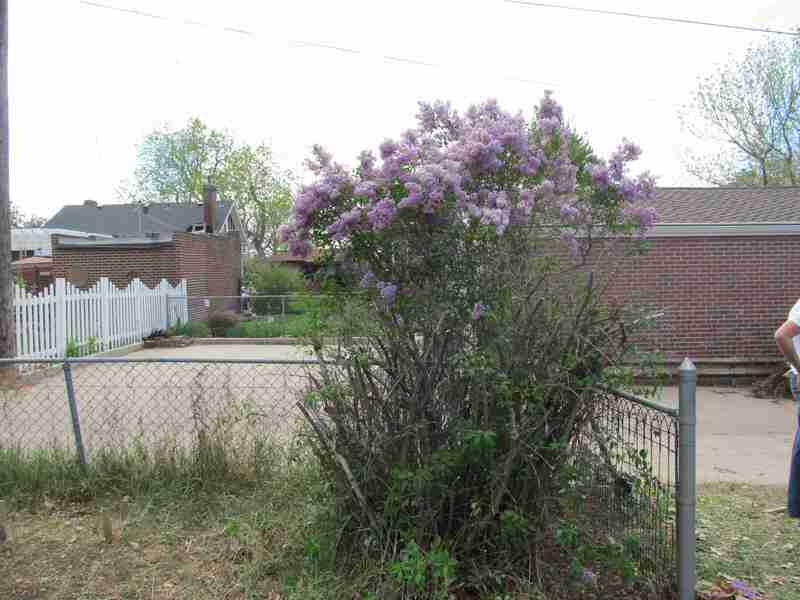 The owner has limited time in her life, but has wanted a garden for some time now. It was going to be a four-by-four or maybe four-by-eight plot fenced away from her dog. Then we started talking compost. 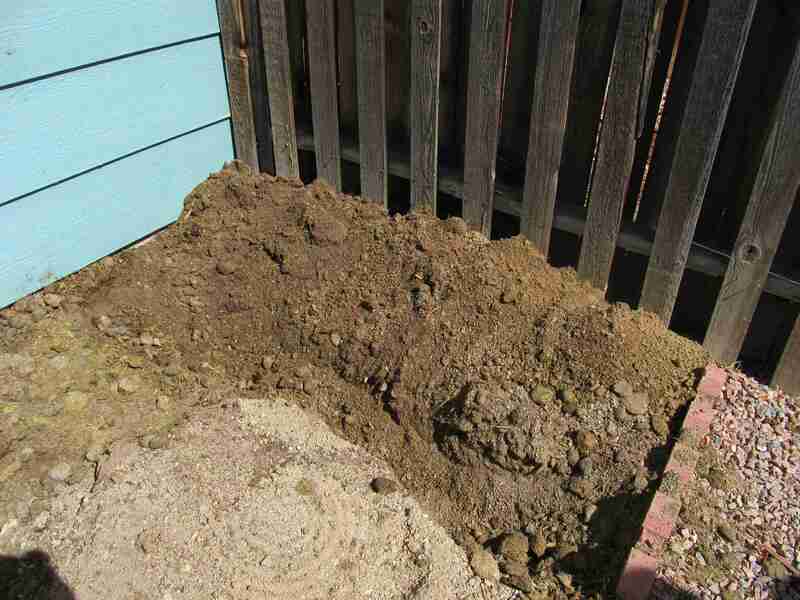 She had already discovered that compost and the dog don’t mix well, so it had to go behind the fence, too. By that point, well, why not just fence off a whole end of the yard? 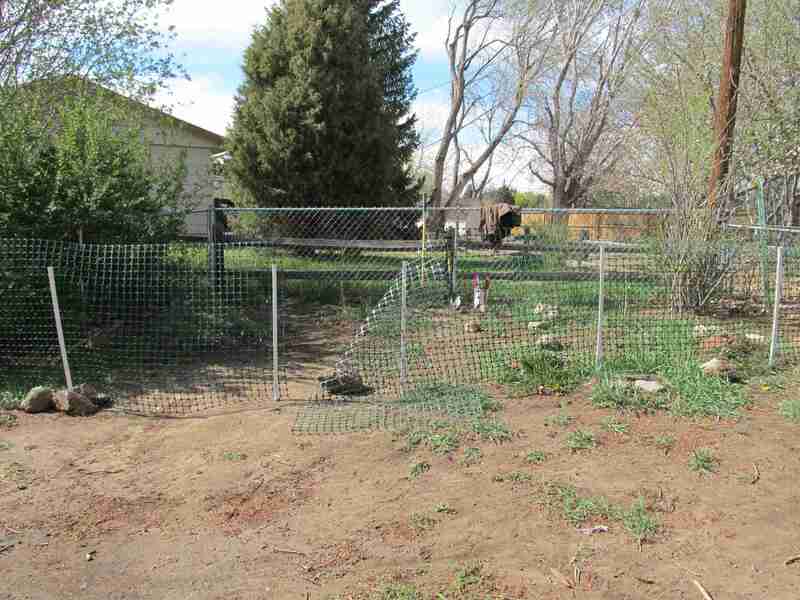 Fortunately, the dog is older and not inclined to argue with a fence, so we were able to go with a fairly inexpensive setup. It mostly just had to delineate where she was allowed and where she wasn’t allowed. 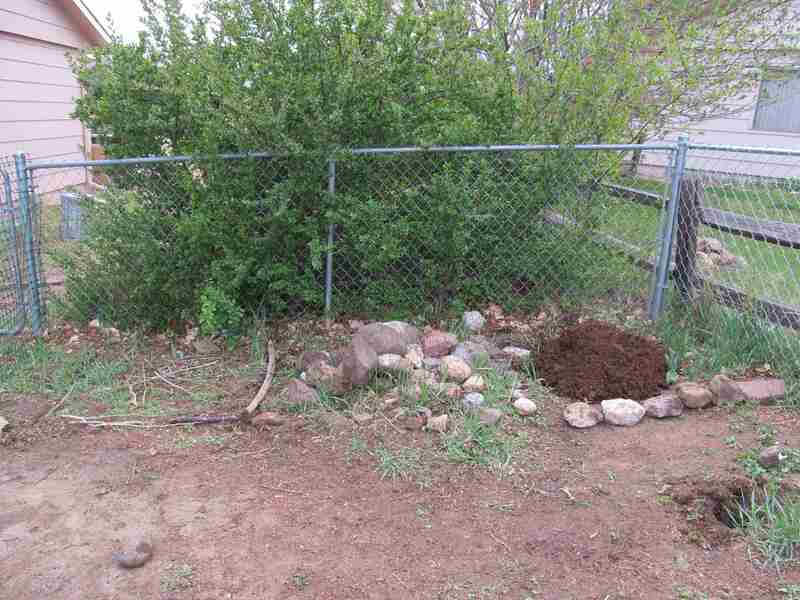 Three compost piles, as soon as I put the rock pile to use. soon as the ground is workable. That is about mid-April around here. Given how warm it has already been, I didn’t want to hesitate on getting them started so that they can be established before the summer heat gets serious. Some of those rocks are plotting out the future garden beds. pleased to see lots of different kinds of decomposers already at home in the area. The ants were not my favorites to come across, and I need to do some more research to see whether they are beneficial or potentially harmful, but seeing healthy communities of animals at all was a good start. I only came across two earth worms, but I’m hoping that’s just because my disturbing of the area scared them off rather than because there are only two. Of course, one of them was enormous, so it might count for two or three when it comes to volume of materials handled. level and mix in some fairly well decomposed horse manure I happened to have on hand. I really need to get a garden fork before I turn the other plot, but it worked well enough. It took about two hours to get it all turned, but I expect it will take less time in the future as I get more fit. After that, I measured it into four quarters for the four types of potatoes and planted each in a quadrant. One of the neighbors came out to see what I was up to and let me know that they hadn’t had any luck with potatoes due to the heavier soil. Hopefully the double-digging helped, but my fingers are crossed anyway. I think the center of the plot was a solid 10 inches higher than it had been before I dug over the area. With any luck, I put in enough air-spaces for the potatoes to have enough room to grow. I am also considering hilling them up with straw instead of dirt, since I don’t have much dirt to spare in the bed, and it will give them more air-space for growth. Plotted, planted, and watered. Pretty, isn't it? 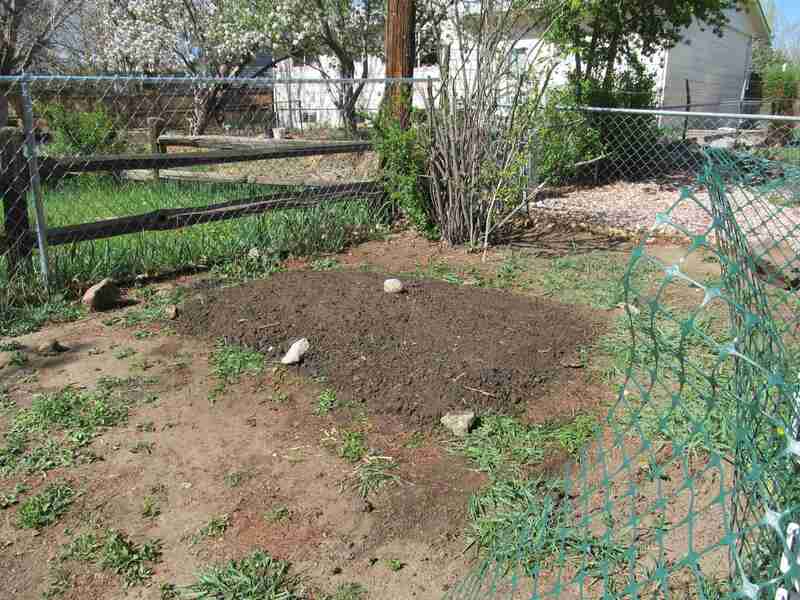 My next step with this garden will be to dig over and start planting the other vegetable bed. I’ll be getting to that as soon as I get a chance. This is a rather ambitious undertaking, but I’ll be moving into the house soon, so it will become my baby more than the other gardens, which are really me helping others create their babies. Hooray for a yard to play in! Happy Earth Day! I don’t think there’s a better way to celebrate the Earth than to spend a day covered in it. It’s been a while since I’ve gotten to hang out with the Heirloom Gardens crowd. Today was a mostly physical day. We met for about three hours to do the initial prep work for a garden they have been using for several years. I am no good at eye-balling sizes, but there is a lot of room for veggies in the plot. 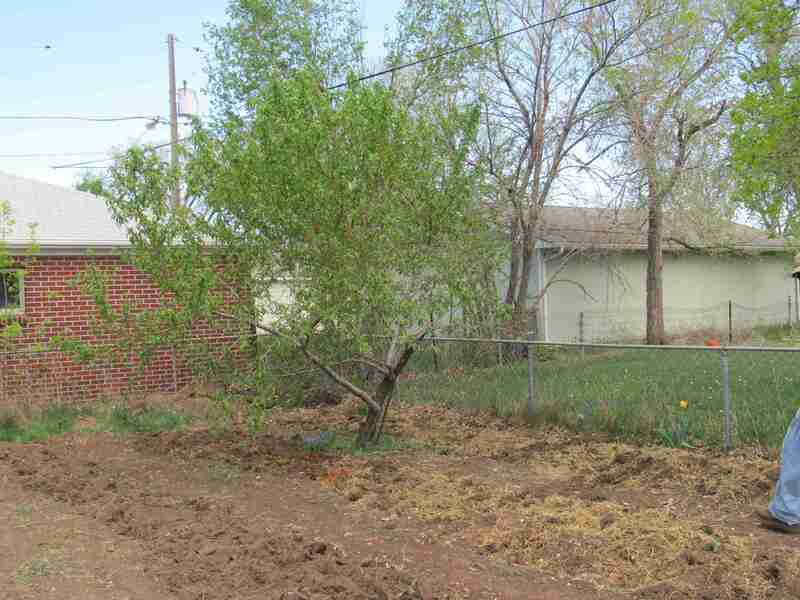 It even has a gnarled peach tree that has set fruit to be used by the CSA. There were almost a dozen of us there, so there was lots of work to go around, but we weren’t overwhelmed by it. quite as much talking, as we were spread over a wider area, but conversations ranged from the lack of right-corners in permaculture to the fact that Barbara Kingsolver reads her more recent books for the audio-books. Again, I didn’t hear any philosophy or reality TV discussions, but there were things to talk about, and there were quiet discussions going on all over the garden as people moved around and worked near different people. In the gardens I’ve been playing in so far, I’ve been lucky enough that I haven’t really had to deal with a winter’s worth of weeds. 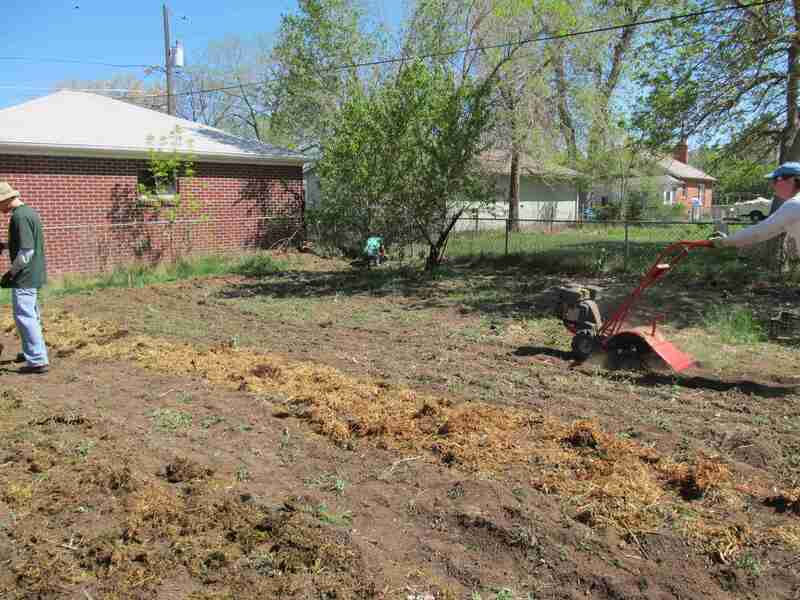 The first step was to dig and pull up the biggest chunks of weeds that would be likely to foul the rototiller. 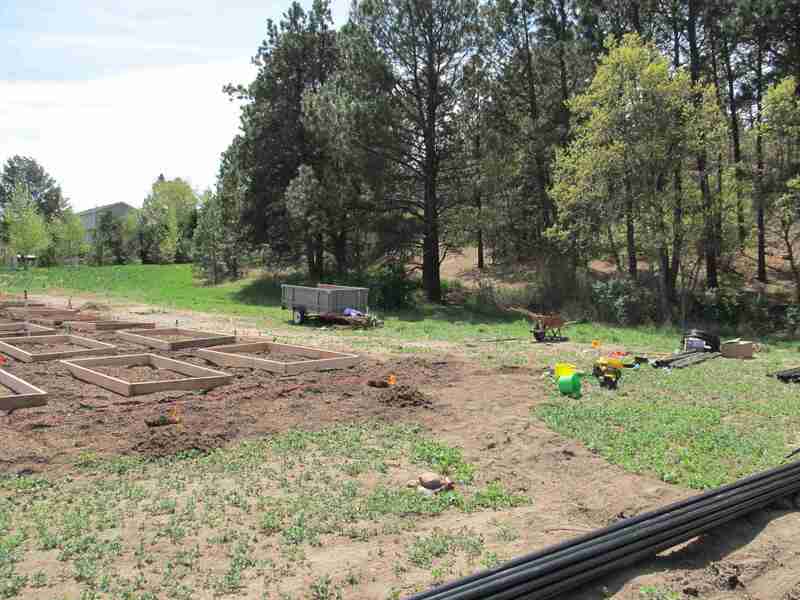 Once most of us had gotten a good start on that, someone was assigned to measuring and plotting the long beds. Sundari plants in beds rather than individual rows, as it is a much more efficient use of space. That meant that each section was four feet wide, with two-foot paths between them. 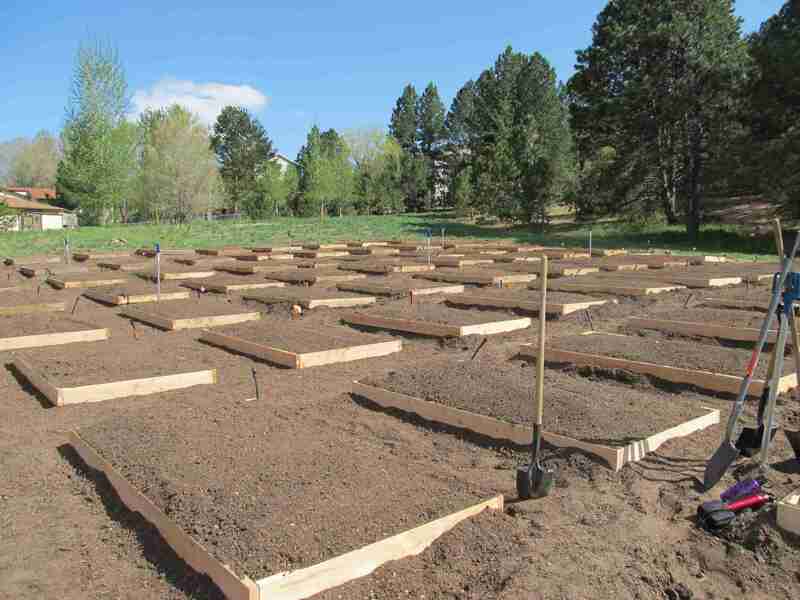 When the garden is planted, each row will then be divvied up into sections for each type of plant that is to be grown. The tulip and the grape hyacinth under the peach tree were to pretty to disturb. Once each bed was measured out, the tiller was run down both the beds and the paths to loosen the dirt and dig the remaining weeds into the ground to finish killing them. Most of them, anyway. The manure, chicken and goat, was laid on each bed and dug in by hand, as it seems that tillers and straw don’t get along very well. It did give me a chance to work more closely with some of the people, as they are in the habit of each person digging in half of the bed and working in pairs down the row, and have some interesting conversations. Someone mentioned that you got used to the smell. I’m more accustomed to cow, but manure smells like spring to me. Growing up in Amish country, you knew when planting season had come if you drove anywhere with your windows down. Sure, the smell was . . . not roses, but spreading manure was part of their farming practices to use what they had for all it was worth. Unlike the almost sterile agri-business farms, there was no hiding where this fertilizer came from. The last step was to scatter clover seeds along each path and scratch it into the soil a little bit. If you use clover as a cover-crop or on your paths, don’t expect a clover-free lawn right beside it. Apparently, along with being a nitrogen-fixer and green mulch, clover is tenacious and willing to spread. The lilac wasn't so lucky. I ache, my feet are killing me from jumping on the shovel to dig out weeds and dig in manure, and I’m wondering if my palms are going to actually bruise from the “T” handle on my shovel. Fortunately, the tank-top worn today helped to even out the farmer’s tan started yesterday. I doubt I’m the only gardener nursing these pains and loving the fact that they signal the beginning of another season. P.S. 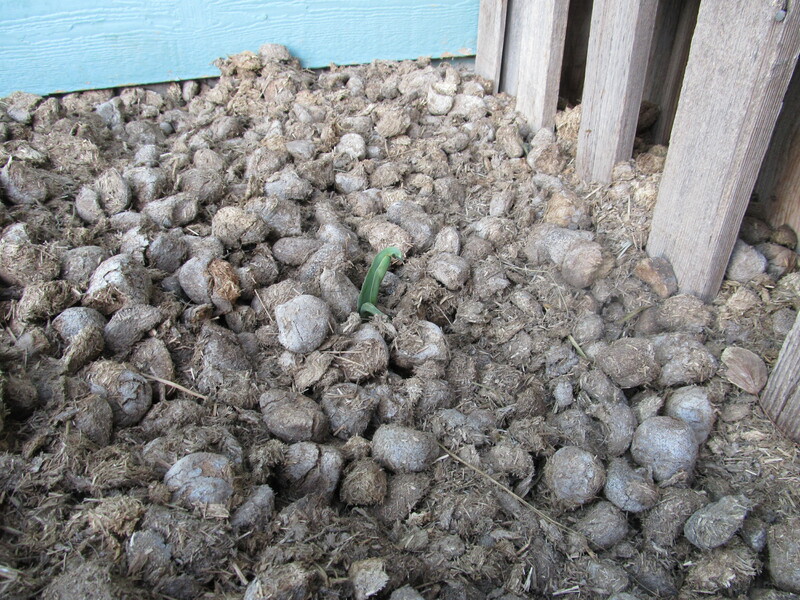 It seems that the garlic we planted in March is coming up nicely. If you haven’t gotten yours in yet, it might not be too late! This is the first class I started with Sheridan Samano, and the most recent one that I finished. It is usually held over an eight-week period, but with her more intense travel schedule, it was condensed to eight classes in four weeks. To be honest, two classes each week probably helped me on the quiz we started each class with, since it hadn’t been a full week since I had learned the information. This class, even more than the ecology class, felt like a college class. There was a lot of information to cover, and we even had a text book. I recommend Brian Capon’s Botany for Gardeners to anyone that is interested in the why behind the how of gardening. It is accessible without being shallow, and is small enough to not intimidate. There were a couple of corrections to the book that we got in class. The favorite color of bees is yellow, not purple and blue, and there are more than four hormones that we now understand. We talked about a fifth, briefly, but apparently the number keeps growing. Botany is an under-studied and under-researched field. Sheridan herself got into it kind of sideways, since her first interest is birds. She started learning about botany to better understand the birds’ locations and habits. Being a botanist isn’t a show-stopper of a career like a marine biologist or an avian biologist. After all, they’re just plants, right? How exciting could that possibly be? It turns out, even if you don’t take into account carnivorous plants, it can be quite exciting. Everyone should remember from their middle-school and highschool science classes that plants are the primary producers. They are the organisms that take sunlight and make food that every other organism uses one way or another. The ways that they have found to survive and thrive in all sorts of environments to continue to do so are fascinating. We all know that plants have been around for a long time. There are four classes of plants: Bryophytes (moss), Pterophytes (ferns), Gymnosperms (“naked seeds”), and Angiosperms (“vessel seeds”). Bryophytes, or non-vascular plants, are the oldest. Angiosperms are both the newest and the most prolific. They are also mostly what we use in our gardens. After all, the bulk of gardening is done for flowers and for fruit (technically just a fertilized ovary) which are only found in this class. The variety found in plants is both fascinating, and potentially challenging. Anyone who gardens has run across the fact that some things just won’t grow in some locations. With this class, those locations have gone from large areas to very small ones. 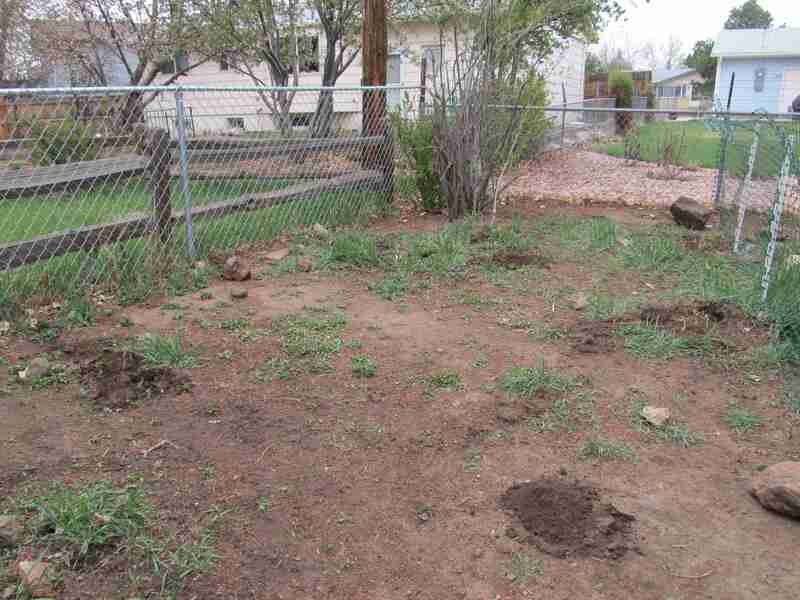 Don’t plant native Colorado plants in what used to be your vegetable garden. Their death will have nothing to do with elevation, water, or sunlight. It will have everything to do with the fact that they are designed for a harsh environment, not the lush richness required by vegetables. Don’t plant broad-leaved, shade-loving plants in a sunny spot around here. That death will have everything to do with the sun. When choosing indoor plants, bear in mind that most commercial houseplants are tropical plants that grow in the shade. They can handle the limited sun of a house without growing toward any sun they can find. As with anything, the more I learn, the more I find that I don’t know. However, this class was a fantastic start to understand the whys behind so many gardening hows. Also, as long as you aren’t a Poison fan, here’s a conversation-starter for you. Every rose does not, in fact, have its thorn. They have prickles. I have worms! In a good way. About 100 worms. Smaller than I expected. Yep, I now have pets. I picked them up at a local store and deposited them in their newly-crafted home. When I got them I stuck my nose in their little carrying cases and it was so nice to smell honest-to-goodness dirt! I started with a little over 200. They were pricy, and I could have done better online, but I wanted to pick them up instead of having them shipped. My mail has a bad habit of languishing in my mailbox for a day or two before I pick it up, and I didn’t want to lose any to frostbite. I also decided that as quickly as they breed, it was probably best to start small rather than risk being overwhelmed in short order. Apparently your population can double in 90 days. The latest in sustainable chic. and they live for eating compost, unlike nightcrawlers that need more actual dirt in their life. As long as their environment doesn’t dry out, they shouldn’t have any reason to want to leave their comfy little box where they get their food hand-delivered. 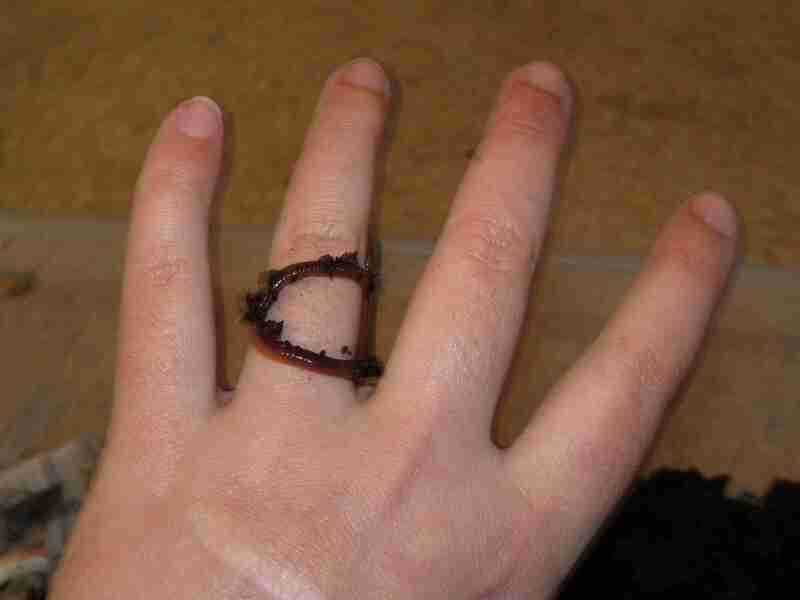 I got my worms about a month ago. In that time I’ve learned a couple of things. The tray under the box is less to deal with water and more to hold onto the worm casings that fall out every time you move it. Like so many other things around here, they dry out quickly. Don’t underestimate your needed number as badly as I did. Particularly if you have some very sad vegetables in the refrigerator that are more suited to worm food than people food. They don’t, quite, keep up with my current scraps which means that they’re no help when it comes to cleaning out the fridge. I have also discovered that if you don’t overfeed them, their home smells nice and earthy. Chopping your veggie scraps into smaller pieces helps them eat it, and it’s not that hard to rinse out egg shells to dry and crush for their grit/calcium supplement. Apparently worms have crops like a bird that requires grit to grind up the food. Given a choice, they're mostly camera-shy. 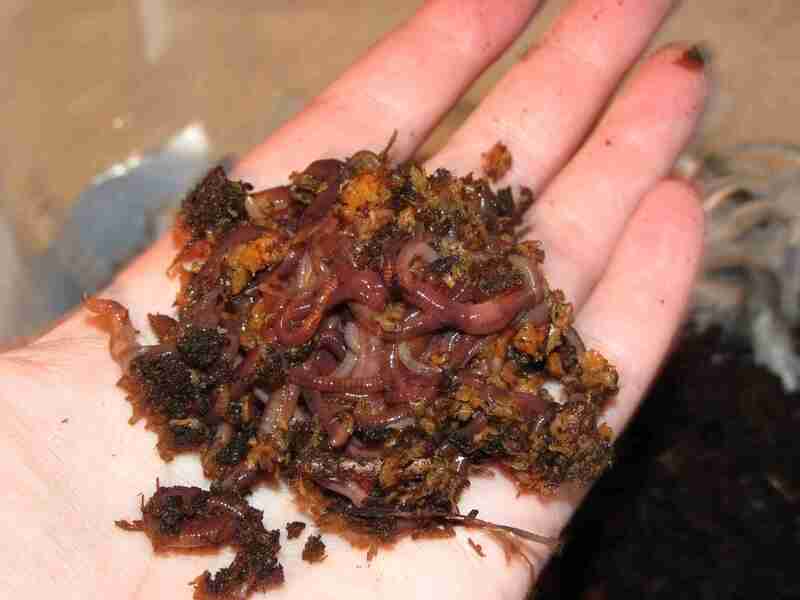 I have been tossing around the idea of supplementing my worm count so that I can stop sending vegetable scraps down the trash disposal, but at this point I think I’ll just be patient. They are doing a number on their bedding and the food that I do give them, and I don’t have a place to use the casings just yet. I am pretty excited to see how much they can produce for me, though, when I start eating out of my garden and I have more vegetables for me and scraps for them. More desiccated than expected, but clearly somebody's happy about it. 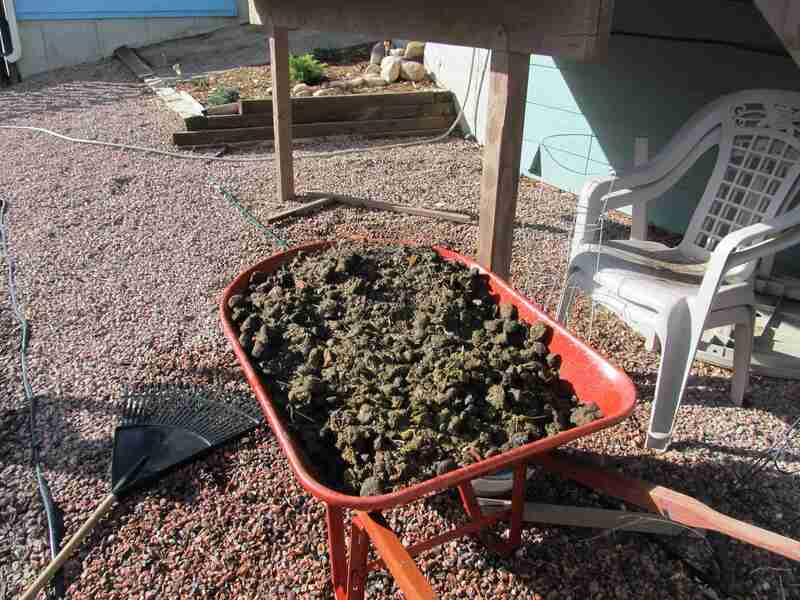 little concerned about the manure that we used, because it was quite fresh when we got it. 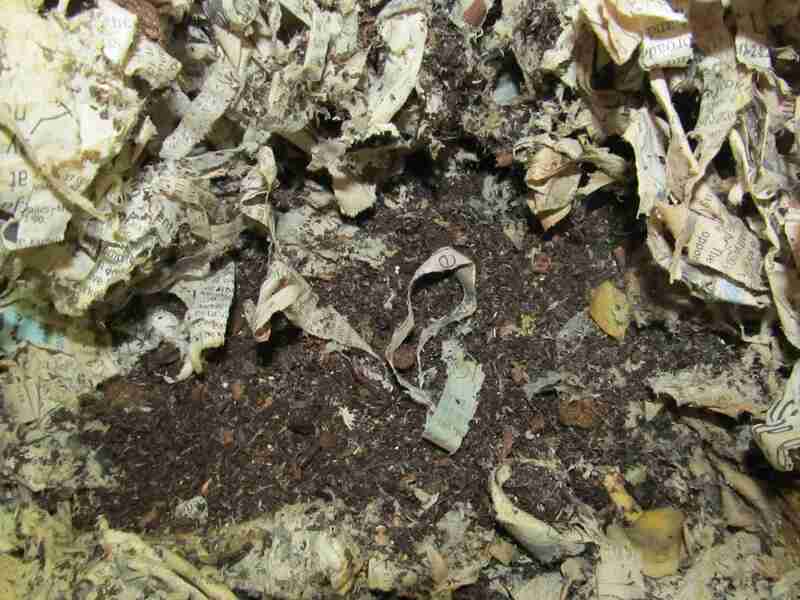 Insufficiently composted horse manure can burn plants with the high nitrogen content. I was even more concerned when I stopped by to check on it and discovered that you even need to water your manure piles around here if you expect them to break down. However, I was comforted to see a tulip that had been planted a couple of years ago but hadn’t deigned to come up last year. It was removed when we turned the manure pile that day, as this is going to be just vegetables this year. The first thing we needed to do was remove a fair amount of the manure that had been sitting there for a while. I was over-zealous in my application of it. However, it means that we have plenty to add to other beds and to work in later as we rotate through the crops. By not overwhelming the soil with that much organic material all at once, we can hopefully get the decomposers in the soil to keep pace with what was left. While we were turning the soil, we ran across three or four earthworms. That’s not a lot, even for a little plot like this, but it is more than none. With any luck, they’ll put out the word to their friends that there’s food to be had. The more decomposers we can attract, the more organic material we can work in, as it will be turned into something that the plants can use. The turning technique that we used was double-digging. It’s a tiny plot, and I’ve been wanting to give this a try for a while, so we opted to do it all by hand. 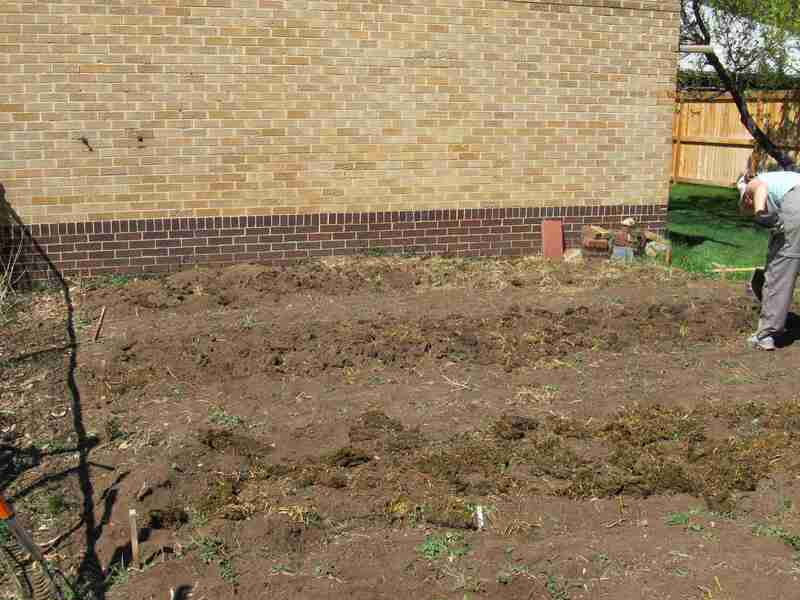 The short version is that you dig out a trench one spade or shovel deep then you use a garden fork, or in our case a mattock, to loosen another four to eight inches of soil. We also took the opportunity to mix some of the manure deep into the soil to give any plants with deep roots further nourishment. The soil from the first trench is set aside and the soil from every subsequent trench is rolled into the previous trench after the bottom had been loosened. 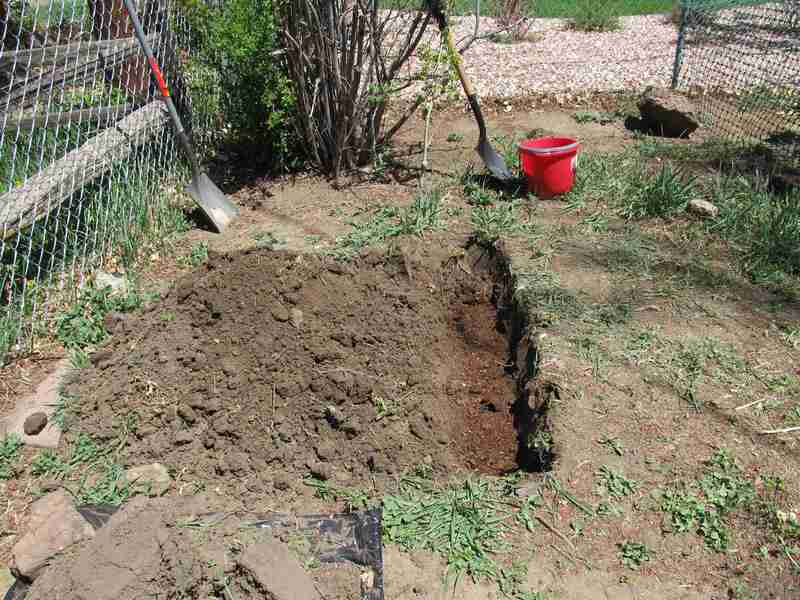 This is not only easier than pulling each trench out and replacing it in the same row, but it also helps you mix the soil in the garden so that it is more uniform. path, so the way to reach the back corner was to step carefully between the plants. This leads to seriously compacting the soil around the roots of the plants. It had also been sitting untouched all winter, so the aeration was necessary to loosen it up for the tender seedling roots, since we haven’t built up a worm population to do so for us just yet. I expect that we should be double-digging this for at least one more year, if not more, to really work the organic material and air into the deep pockets. Once we had replaced the last of the soil and evened it out, we added some ammonium sulfate to increase the nitrogen content and, being a sulfate, hopefully lower the pH a little. That got watered in. After that, we measured the space for the path and tamped it down. Because that particular section was for feet, not plants, it didn’t need to be aerated. We also measured out the squares for the first of the things to go in. We are doing two rounds of peas to stagger the harvest a little, so we planted the first round. We also put in a square of carrots and a square of onions, since they are fairly cold tolerant. With the warm weather that we have been having, we opted to try some lettuce and cilantro. The snow later that week made me wonder if we’d jumped the gun, but since it has warmed up again, I suspect not. We were going to plant some kale for a spring harvest, but with as hot and dry as it is, I think even lettuce might be pushing it, so we will be planting the kale later for a fall harvest. Once everything was in the ground and we had watered it a second time, it was pretty clear why the soil sample had come back as loamy sand. It was almost like looking at a beach. However, it was a fluffy beach, now, and it should start sprouting green pretty soon. Weather has been pretty warm and dry across most of the country this spring. In some places, that’s not such a bad thing. It means that people can get their gardens turned and started a little earlier than usual. Around here, though, it’s not such a good thing. On the Front Range of the Rocky Mountains, we get most of our moisture in the winter and in the form of snow. March is generally the month with the most snow. I heard somewhere that we should get about 20% of our snow in March. According to this site, the average snowfall is 8.1″ for Colorado Springs. That doesn’t sound like much, until you see 4.9″ each for February and April. This year, according to this site, we have had less than an inch in March. The lack of snowfall combined with temperatures that were frequently in the 60s and 70s instead of the 50s that were the historical average, means that we were losing snow this March instead of building it. I am new to this area, and maybe if I were familiar with a typical March, I might be more appreciative of the “early spring” that so many people are enjoying. I am also enjoying it. It’s nice to be able to start my tan this early to banish the winter pallor. However, if it is this warm this early, what is this summer going to look like? With as dry as it has been, we have already had one wildfire this year. This doesn’t bode well for what is going to happen during the more typical wildfire season around here. The drama of fires aside, the loss of snow means that there will be less snow melting this spring to provide the moisture needed to germinate seeds and bring annuals out of dormancy. Less water coming from the mountains means less water for our consumption. On the frivolous side, that means that Kentucky Bluegrass lawns may not be getting the water they need to exist in their lush glory. On a more practical side, watering bans I believe also include vegetable gardens. Most people grow vegetables that are from Europe and the east. That means that they need far more water than natives in order to produce the food we’re looking for. April came in like a lion. Sunday was 80 degrees. Monday topped out at about 45 with the clouds rolling in to cover the sky from horizon to horizon. Tuesday was even cooler with snow falling for most of the day. It’s warming up again, and most of the snow in the city is gone now. It doesn’t tend to stick around very long. 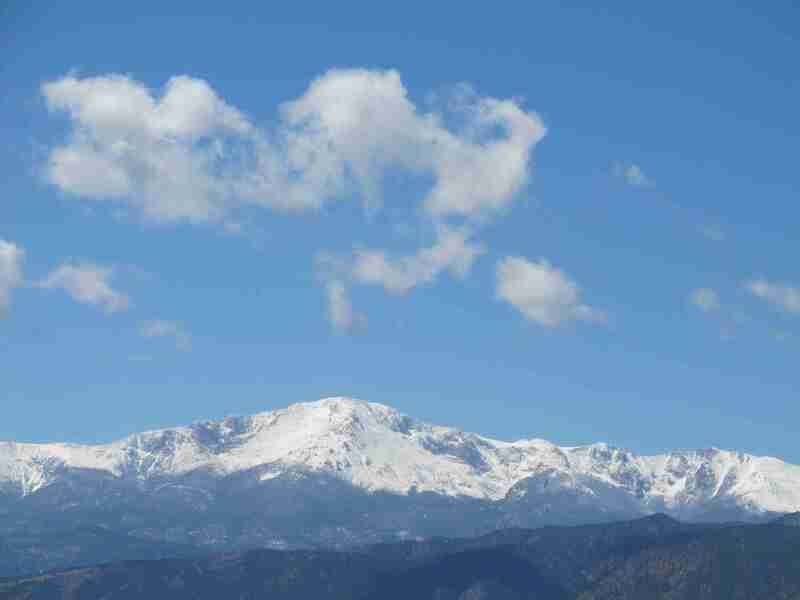 However, it’s comforting to me to see Pike’s Peak resuming its (his?) white mantle for at least a little longer this season. A little moisture in reserve for later.